How Would a Corporate VLOG Help my Business? VLOGs, Video-Blogs, are an increasingly popular form of business-to-consumer communication that offers significant advantages when paired with standard website and social media marketing activities. The merger between YouTube and Google has led to increased visibility for online corporate video marketing. VLOGs are an excellent way to reach out to customers who are looking for information on your services, but are hesitant to wade through pages of website copy to make their consumer choices. These potential customers are more likely to do an exclusive video search, or click on a link which shows a video thumbnail. 1) You are up to date on current industry matters. 2) You are dedicated to outward customer communication efforts. 3) Your company demonstrates follow-through over a long-term period. These three conclusions lead a potential client to take the first step towards trusting you with their business and open them up to building a relationship with your company. The fact that you have chosen to reach out through video also helps establish trust. Video is a highly personal medium. It engages multiple senses and can mimic the effects of a personal conversation better than any other mass marketing media. As a result, VLOGs are more likely to enable viewers to feel you are reaching out to them personally. 1) Keep your videos short. Potential Customers are much more likely to click on videos that are two minutes or less. Limiting your video length will force you to communicate efficiently and will help you hone your messaging. Topics that are too complicated for a single two-minute video can be addressed in a video series instead. 2) Create searchable titles. The main goal of a VLOG is to increase your company’s visibility, so make sure that you use SEO-friendly titles and keywords for each of your videos. This practice will increase your general search-ability, but more importantly, you will be able to reach more members of your target audience. 3) Don’t go into too much detail. Make sure that your content is relevant and helpful, but there is no need to give away trade secrets or provide free services. Simply lay the groundwork for the customers to contact you with their needs. 4) Continue creating new content. Vlogging is only effective if you continue to upload content. Everyday thousands of new videos are uploaded to YouTube and once you stop vlogging, your content is quickly pushed into the cyber abyss. In addition, potential customers may observe the old dates on your videos and assume that you are no longer in business since they haven’t seen any recent activity from you.If, however, you continue to post, your VLOGs will build on themselves and your newer videos will re-enforce the potential of your initial videos. 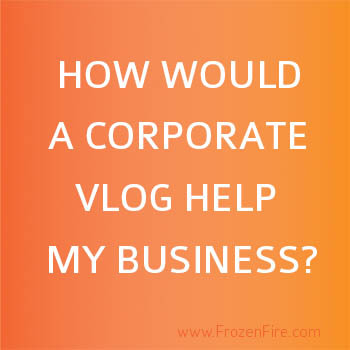 If your company is ready to receive the benefits of a corporate VLOG, Frozen Fire can help. Contact us to get the process started. Frozen Fire is a digital business development and communication strategy firm that exists so that businesses have the tools necessary to know exactly who their customers are and what their customers are looking for; we help companies connect with their customers via digital marketing strategies; and we help them to drive their sales, business development and marketing efforts, so as to gain the maximum return on their investments in terms of marketing dollars, efforts, and human resources. Contact us to learn how we can help your business know, connect, drive. Want to know more about video pricing. Check out our article here. Please send resumes to jobinquiry@frozenfire.com. Not a fan of online forms? No problem. CALL or EMAIL and we'll get started right away (seriously, we're fast). 2019 Frozen Fire©. All rights reserved.